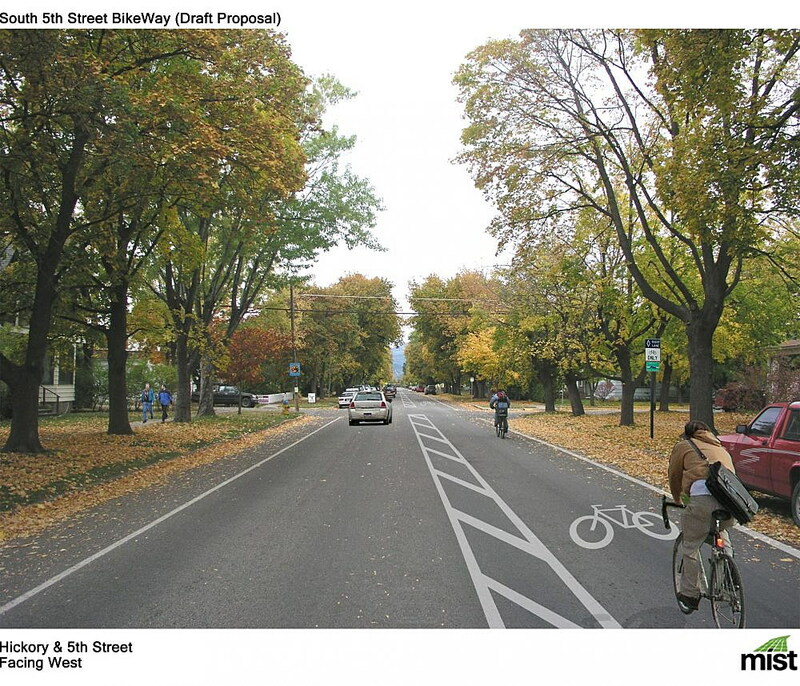 In the rendering of South Fifth Street, walking becomes more pleasant and safe, the street gains a buffered bike lane, driving flow and safety improves, and transit accessibility increases. Transportation is critical for community health. Streets and trails connect us to goods and services, leisure and recreation, and to each other. A primary reason for the formation of a village, community or city is to interact in close proximity with fellow humans and provide each other sustenance. Ensuring safe and equitable access to the public right-of-way is a responsibility shared by all. While movement of the body is essential in order to stay alive, too often this movement results in tragic consequences. Every day on this planet, 4,000 people die in car crashes. In addition, 150,000 people are injured. Missoula has not escaped this peril. In the past year, several pedestrians have lost their lives when crossing a street. These crashes are visible reminders of transportation improvements we need to address as a society. Improving the transportation system means increasing the ease and opportunity for people to move in ways other than driving. Missoula implemented a policy in 2017 to triple the rate of people walking, biking and using public transit. In order to achieve this mandate we must grow a transportation infrastructure conducive to multiple ways of getting around. Streets and trails are the arteries and veins of the community body. Missoula has many options to improve our collective transportation infrastructure. Community pathways, for example, are a direct way to improve non-car travel. We can fill gaps in the urban trail network, extend those trails to outlying areas and connect into a regional walk/bike system. Similar to connecting trails is connecting on-street walkways and bikeways. Our Complete Streets policy, adopted in 2009, calls for such. A challenge with the bike system is the interaction with cars. Increasingly, there is a need for cycle tracks, also known as protected bike lanes. Cycle tracks have a physical barrier between the driving lane and bikeway. North Higgins is the lone Missoula example. The revamp of Russell Street will feature a different kind of protection – a raised bike lane. How to best design for the interaction of cars and bikes is a pressing challenge for Missoula transportation. Crashes and congestion happen mostly at intersections. A solution is the modern, single lane roundabout leading to better safety and flow. Roundabout benefits, when compared to signals, include (per intersection): $5,000 saved per year in electricity, 65 percent less congestion, 200 tons of carbon dioxide saved per year due to less idling of engines, and 95 percent reduction in injury crashes. Safety in a roundabout stems from eyes on each other, all right turns, and low speeds. Roundabout flow is similar to the planets, atoms and rivers. Missoula roundabouts need work to become more accessible, especially for people with vision challenges. This can be achieved by adjusting entry and exit geometry which widens the field of vision for drivers. Parks, plazas and greenways provide more options for healthy mobility. Parks are oases of green space, often with trails running through. A plaza is more intensely urban, common in city centers. The plaza is both a transportation connection and public gathering place. Neighborhood greenways are walk and bike priority streets with simple features that prevent cut through auto-traffic. These greenways connect to each other, to the trail system and to the arterial street network for maximum accessibility. While some roads need additional turn lanes as we grow, many of Missoula’s arterials need to be reconfigured to accommodate people walking, biking, and busing. A simple and effective transformation technique is to change a 4-lane road (2 car lanes in each direction with no turn lane) to a 3-lane road (one car lane in each direction with a designated center left turn lane). With a center turn lane, car flow and safety improves. The extra space can then be reallocated into walk and bike space. Missoula has potential for a world-class transportation system that serves all people and modes. With thoughtful design and community collaboration, moving around will be inviting, safe, and memorable. More walking, biking and public transit, along with safer and smoother car flow, helps diversify our mobility system and creates resilience. If we put our heads, hearts and hands together, there is no stopping this movement for a sustainable future. July 22: 6thAnnual Windemere SUP Cup, Standup Paddle Board Competition on the Clark Fork River (followed by a MT Luau). Benefits Watershed Education Network & Missoula Food Bank EmPower Pack Program. July 24: Bike Rodeo & Free Bike Repair at Franklin School, join Free Cycles and Let’s Move Missoula to help kids build bike maintenance and safety skills, 4-6 pm. FREE & family-friendly! July 24: Montana Ready Communities Initiative Missoula Resiliency Summit, How can we make our community more resilient to fires, floods, other problems? Share your ideas with local planners. Missoula City-County Health Department – 301 W Alder Street, Missoula. 1:30 p.m.-4 p.m.
July 24: Clark Fork Coalition River Survey Volunteer Training, contact volunteer coordinator Katie Racette for more info: Katie@clarkfork.org, or 406-542-0539 x212. 6-8 p.m.
August 2: Climate Smart Monthly Meetup: Water + Climate,Imagine Nation Brewing Community Room. 5-7 p.m.
August 7: Summer River Cleanup, Join Western Cider & Clark Fork Coalition to clean the urban stretch of the Clark Fork River. Volunteers can then relax with a cold cider and yummy food from local food trucks. 5:00-8 p.m.